…we are also deeply concerned that the Delaware Art Museum has refused to disclose publicly the works of art that it is considering selling. 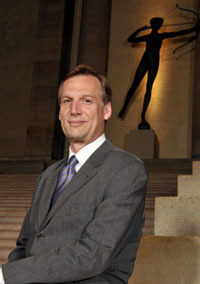 Given the importance of this decision and its potential impact, we believe that such information should be shared with the Museum’s members and the community as a whole so that they can understand what is at stake and be reassured that the action taken by the Board of Trustees does not violate donor intent or other strictures. AAMD does intend, as it has said in the past, to impose sanctions on the Delaware Art Museum if it goes ahead with its plans to sell $30 million worth of art to pay its bills. We also reaffirm our offer to help the Museum explore alternatives to this course of action. Yet he has not, to my knowledge, even hinted at what alternatives he might be able to suggest than the museum hasn’t already explored on its own. I realize that negotiating in the press is not a good strategy, so I’m not expecting details. But how about a few general hints? I for one would take the letter more seriously if he were more specific.